None of that stress for me, guys. I'm going to be what makes me happy this year: food. And here are some of my favorites. Mostly DIY, mostly human (! ), but all of them delicious. I know this one is done to death, but whenever I see someone in a grape costume I immediately crave grapes. Mission accomplished? Aw yeah, who doesn't love cookie butter? People who hate happiness, that's who. Anyone that's been to Disneyland or Disney World knows about this epic cool treat—it's definitely one of those must-have foods when you visit either park, and I love how this costume includes the signature pink umbrella on top that the Dole Whip Float comes with. I'm calling her out on accuracy though—if she was really committed to the cause, she'd have Cheeto fingers. Jelly Bellys are just the start. Where are my Bertie Bott's Every Flavor Beans boxes? I wonder what a vomit-flavored jellybean would look like in balloon form... or, on the much more appetizing side of the Harry Potter-verse, a butterbeer-flavored jellybean. Mmm, butterbeer. Mac 'n' cheese is life. And if I can't eat it every day for every meal, I might as well be it so everyone knows how nuts I am about it. I had to restrain myself from making this list completely out of kids' costumes; something about kids dressed up as food just gets me. With that said, I couldn't leave this one off the list: with a headpiece of wasabi and pickled ginger, this little California sushi roll (I see you, imitation crab meat, avocado, and cucumber!) is insanely adorable. Still waiting for the other versions of sushi to become costumes: sushi burgers and sushi cake, anyone? I've seen a fair amount of Starbucks costumes, but I was especially impressed at how legit this one looks—the straw and accompanying barista are nice touches. But which ultra-sweet flavor is she: caramel frappuccino, java chip, or (gulp) pumpkin spice? Honestly, I think this costume makes Froot Loops look more appetizing than it actually is. Or maybe I'm just a hater of artificially-colored, ridiculously-sweet kids' cereals. You be the judge. For when you want to pretend you're healthier than a burrito—but you still need the chips and guac on the side. The lettuce leaf on top is the icing on the cake, in my opinion. Little disappointed that she didn't include the random flavors of Tabasco that your college buddies used to steal in more desperate times (or, let's be real, that they probably still steal because they're cheap bastards). Got any other delicious costumes that we've missed? Let us know in the comments! 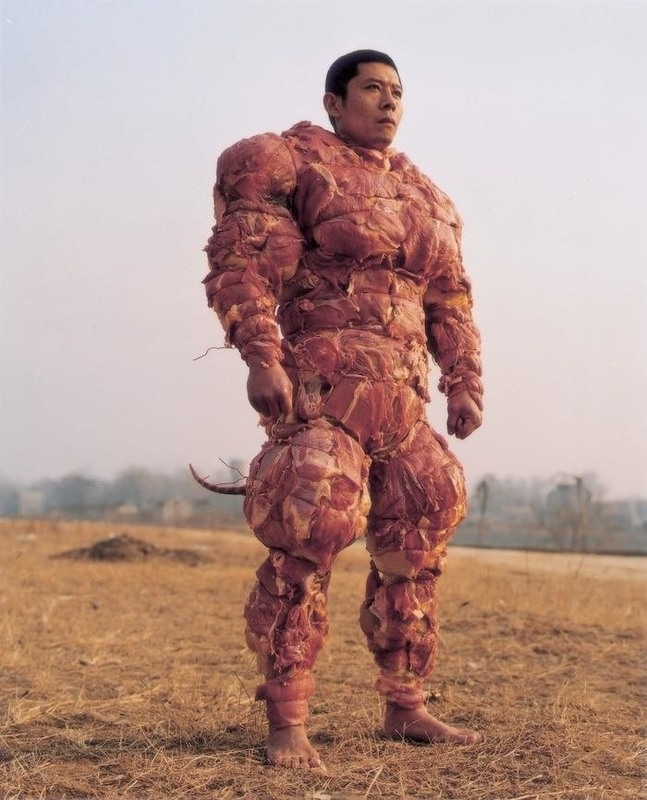 Bacon armor. Make's Lady Gaga's meat dress look like tofu.